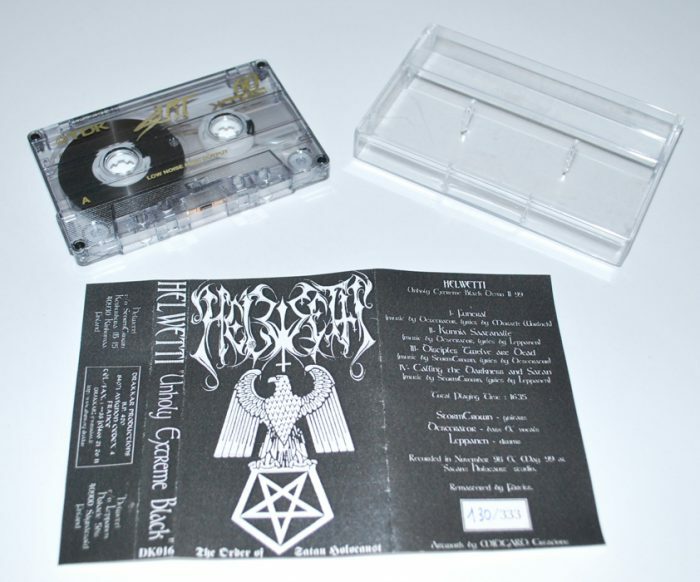 Released in 1999, Unholy Extreme Black is the second of two demos released by the transitory Finnish black metal project Helwetti. Here, Helwetti provides richness through depth in the reach of its rather brief material by making constrained technique malleable to the natural requirements of a flow aimed at bringing in new ideas in a coherent yet always evolving stream. The secret of the elite, almost non-existent underground to producing rare minimalist music of such sublety is a rather bestial and ritualistique effort fueled by dark spiritual ideas founded on enacted reclusiveness. Within this darkness embraced, the true artist manages to bring a powerful invocation of infernal —lower-world, unconscious to the uninitiated— forces in a way that most of the later, allegedly more mature, projects have never reached by a long. The racing melodies of Helwetti’s music in traditional black metal dissonances arranged through percussive changes, opportune breaks and vocal overlays raise its minimalist expression to the best that could possibly be achieved while remaining so simple. The vocals on this recording are an incredible delight to listen to as they express a nuanced wealth of emotions, within this limited framework as the rest of the instruments, greatly adding to the overall atmosphere. The necro sound resulting from the tampering with the original sound gives it a veiled that is certainly not a detriment to the sound of the instruments. Thereby, the clarity of the instruments is not only maintained throughout, but it actually attenuates distractions typical to the metal genre, allowing the merit of the musical arrangements to come to the foreground. In the matter of technique, guitars do not go beyond softly strummed power chords, not quite fast downstrokes and “tremolo picking” on one string. The bass serves as a proper low frequency holder that does not get in the way but noticeably reinforces the texture of the music. Drums vary between laid back, standard rock patterns in duple time, sometimes with triplet feels, that go on smooth crescendos of double-bass runs; these patterns are then alternated with “d-beats” at different speeds, depending on the location within the pieces. These are all very standard and quite basic techniques, but what raises this demo in musical, rather than technical quality, is arrangement of the parts. Logic is not enough, but a sense of naturality must be expressed that can only be correctly represented by the use of intuition. 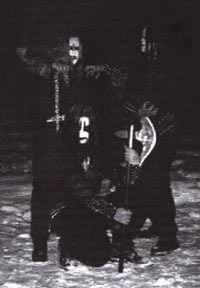 Black metal in general prides itself in placing intuition before mere logic or the debasing —often clownish and overbearing— technique flaunting of death metal. However, intuition depends entirely on an inwardly developed or innately inherited talent of the individual that is not produced by the application of logic. Also, under close inspection, music resulting from the application of logic (structure-oriented death metal, for instance) is quite different from music prominently steeped in the application of intuition (like the best of black metal). Which means that a lot is outside the normally conscious, calculable control of the individual composing. It is just in this trap that the elitism of black metal lies. Within the seemingly narrow constraints of raw black metal, we can appreciate how Helwetti creates a rich variety of fluxions which overflow one into the next. Without leaving any question regarding the soundness of their transformations, adjacent patterns are related by transitions that flow smoothly as water downstream. More interestingly, the four different pieces in this demo act as movements within one work. Arguably, many underground demos were compounded in this way. And without there necessarily being a conscious intent in relating it to the classical tradition, the effect is somewhat similar when a release of the stature of Unholy Extreme Black manages to present variety of texture and theme within a coherent and consistent style, bringing interrelated pieces together further under an hidden phantasm grasped by the artist’s senses. It is in communion with “Satan,” “satans,” or “dead things,” and in their consistent, focused sensations thereof, that the black metal musician brings a stream of riffs directed at channeling patterns which vibrate with what is perceived in altered states. The extent to which such a communion is attained, and perhaps the authenticity or the quality of the experience, is what makes the results vary —not to mention actual musical talent. This is precisely the “ritual” to which many a wordless black metal acolytes (For who is truly an adept in this inherently left-handed path?) refer when attempting to describe what this music is as opposed to other kinds of “music” that are aimed at entertainment or technical exercise or narcissistic indulgence.